Emsco ESP Toboggan Plastic Toboggan 66 in. Flexible Flyer Infant Boggan Injection Molded Plastic Toboggan 27 in. Flexible Flyer Aurora Foam Sled 36 in. Paricon Pull Sleigh Deluxe Baby Wood Sled 29 in. Flexible Flyer Snow Skimmer Foam Sled Foam Sled 40 in. Paricon Canadian Wood Toboggan 72 in. Emsco SnoSprint Racer Plastic Sled 37 in. Flexible Flyer Snow Screamer Foam Sled 47 in. Otter Sport Polyethylene Utility Sled 64 in. Zipfy Plastic Sled 21 in. Otter Sport Polyethylene Utility Sled 53 in. Flexible Flyer Steel Runner Wood Sled 60 in. Otter Sport Polyethylene Utility Sled 43 in. Shur Strike 30 lb. Fishing Line 185 yd. Some of the most popular sports require only a few pieces of sports equipment to get the game rolling. Many people set up basketball half courts in their driveways. For a quick pick up game the only basketball equipment necessary is a basketball and rim and backboard. From the basketball court to a public tennis court, the only tennis equipment to get a game started is a set of tennis balls and a couple tennis rackets. And for an afternoon of catch or touch football, you’ll find football equipment for a low key, informal game with friends includes just the football itself. 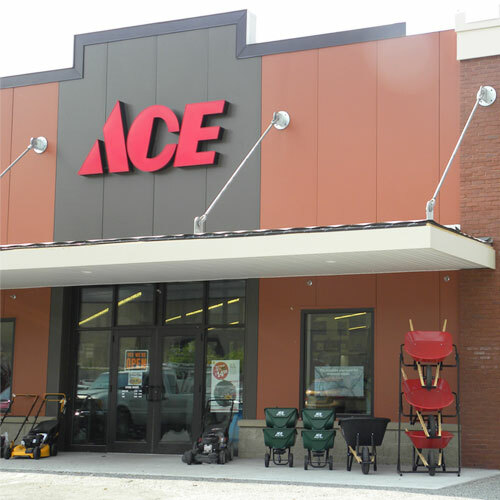 Find the sporting goods you need conveniently at your neighborhood Ace.